Bitcoin price settled above USD 4,000 and started a short-term consolidation. Ethereum retreated from USD 140 and ripple price is testing the USD 0.305 support. MANA and RVN rallied more than 25% today. Yesterday, there were solid bullish moves in bitcoin price above the USD 3,950 and USD 4,000 resistance levels. BTC/USD recently tested the USD 4,050 resistance and corrected lower. The price is currently (UTC 08:10 AM) consolidating in a range and dips remain supported near the USD 4,000 and USD 3,980. Similarly, ethereum price extended gains and tested the key USD 140 resistance. Later, ETH/USD corrected lower and it is currently trading near the USD 138 support. Ripple price traded close to the USD 0.310 resistance, where sellers emerged and later the price corrected lower below USD 0.308 and USD 0.306. There was an upside extension in bitcoin price above the USD 4,000 resistance. BTC/USD traded above the USD 4,020 level and tested the USD 4,050 resistance level. However, buyers failed to gain strength above USD 4,040 and the price later corrected lower. An immediate support is at USD 4,000, below which the price may perhaps test the USD 3,980 support. The main buy area is near the USD 3,950 level. On the upside, a strong follow through above USD 4,040 and USD 4,050 is must for buyers to gain traction. Ethereum price tested the all-important USD 140 resistance level before sellers emerged. ETH/USD corrected lower and recently tested the USD 138 support level. At the outset, it seems like the price is struggling to stay above USD 138 and it could correct towards USD 136. On the upside, the USD 139 and USD 140 levels are important resistances. A successful close above USD 140 may push the price towards the USD 144 level. Bitcoin cash price extended its rally above the USD 168 and USD 170 levels. BCH/USD traded close to the USD 174 level and recently corrected below the USD 170 support. The next key support is near the USD 165 level, where buyers might appear. EOS surged above the USD 4.00 and USD 4.20 resistance levels. The price even broke the USD 4.30 resistance and traded close to USD 4.35. It is currently correcting lower towards the USD 4.20 and USD 4.15 support levels. Ripple price climbed higher towards the USD 0.309 and USD 0.310 resistance levels, where buyers struggled. As a result, there was a downside correction and the price declined below the USD 0.306 support. It is currently testing USD 0.305 and the next support is at USD 0.304. 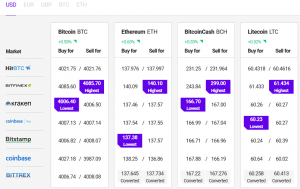 Despite corrective moves in bitcoin and ethereum, a few small cap altcoins gained more than 8%, including MANA, RVN, XTZ, FCT, NULS, AION and BAT. Out of these, MANA climbed more than 36% and RVN is up close to 28%. The current price action suggests a downside correction in bitcoin price below the USD 4,000 support level. However, declines are likely to find a strong buying interest and BTC/USD might bounce back from the USD 3,980 or USD 3,950 support in the coming sessions.